the aggregate of indexes that characterize the resistance of a material to a load acting on it, the degree to which it will deform under the load, and its behavior in the process of failure. Accordingly, the properties are measured in stresses (usually in kilograms-force per sq mm [kgf/mm2] or meganewtons per sq m [MN/m2]), strains (in percent), specific strain and failure energy (usually in kgf . m/cm2 or megajoules per sq m [MJ/m2]), and rate of development of the process of failure under a static or repeated load (most often in millimeters per second or per thousand cycles of the load). The mechanical properties of materials are determined in mechanical tests of specimens of various shapes. Materials in structures are subjected to the most varied loads (Figure 1), working under tension, compression, bending, twisting, shear, and other factors, or they may be subjected to the joint action of several types of loads, such as extension and bending. The conditions of use of materials are also diverse in terms of the temperature, environment, rate of application of the load, and the nature of its change in time. Accordingly, there are many indexes of the mechanical properties of materials and many methods of mechanical tests. Tests of tension, hardness, and impact bending are most widely used for metals and structural plastics; brittle structural materials, such as ceramics and cermets, are often tested for compression and static buckling. It is also important to evaluate the mechanical properties of composition materials in shearing tests. Stress-strain diagram. A load applied to a specimen causes its deformation. The correlations between load and deformation are described by the stress-strain diagram (Figure 2). The deformation of the specimen (upon tension, an incremental length Δl) initially is proportional to the growing load P, and then at the point n the proportionality is broken. However, for the deformation to increase, a further increase in the load P is required. When Δ l > Δ li the deformation develops without application of an external force, under a gradually decreasing load. The appearance of the stress-strain diagram does not change if the stress σ = P/F0 is plotted on the ordinate and the relative extension δ = Δ l/l0 is plotted on the abscissa (where F0 and l0 are the initial cross section and calculated length of the specimen, respectively). The strength of materials is measured by the stresses that characterize the load per unit cross section of the specimen σ = P/F0 (kgf/mm2). 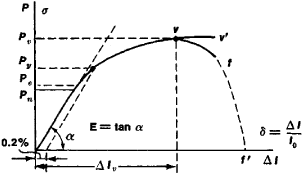 The stress σn = Pn/F0, at which the proportionality of the increase in deformation to the load is disrupted, is called the limit of proportionality. For a load P < Pn, relief of the load on the specimen leads to disappearance of the deformation that arose under the applied force. Such deformation is said to be elastic. The character of deformation may not change if the load slightly exceeds Pn —as before, it will retain its elastic character. The maximum load that the specimen endures without the appearance of residual plastic deformation upon unloading defines the elastic limit of the material:σe = Pe/F0. In nonmetallic structural materials (plastics or rubber) an applied load may cause elastic, highly elastic, or permanent deformation. In contrast to elastic deformation, highly elastic deformation disappears with time rather than immediately after relief of the load. Highly elastic reinforced polymers (such as Fiberglas and coal-based plastics) fail upon extension of 1–3 percent. Highly elastic deformation appears in some reinforced polymers in the final stages of loading. The modulus of high elasticity is lower than the elastic modulus; therefore, the stress-strain diagram in this case tends to be deflected toward the abscissa. Elastic properties. In the elastic domain stress and strain are interrelated by a proportionality constant. Upon extension σ = Eδ, where E is the modulus of normal elasticity, which is numerically equal to the tangent of the angle of inclination of the rectilinear segment of the curve σ = σ(δ) to the strain axis (Figure 2). During tensile testing of a cylindrical or flat specimen, a triaxial deformed state (increment of length in the direction of action of the applied forces and a decrease in linear dimensions in the two other mutually perpendicular directions; δ1 > 0; δ2 = δ3 < 0) corresponds to the uniaxial stressed state (σ1 > 0; σ2 = 0 = σ3 = 0). The relation between transverse deformation and stretch (Poisson’s ratio), Jμ = δ2/δ1, varies in a very narrow range within the limits of elasticity for the main structural materials (0.27–0.30 for steels, 0.30–0.33 for aluminum alloys). Poisson’s ratio is one of the main calculated characteristics. If μ and E are known, then the shear modulus G = E/[2(1 + μ)], and the bulk modulus K = E/[3(l − 2μ)] can be determined by calculation. Strain gauges are used to determine E, G, and μ. Resistance to plastic deformation. A noticeable irreversible plastic deformation, which does not disappear upon relief of the load, appears in addition to the steadily increasing elastic deformation under loads P > Pe. The stress under which relative plastic deformation (or, upon extension, elongation) reaches a prescribed value (0.2 percent, according to the All-Union State Standard), is called the arbitrary yield point and is designated as σo.2 = Py/F0. In practice, the accuracy of modern testing methods is such that σn and σe are determined with assigned tolerances in terms of deviation from proportionality (an increase of 25–50 percent in cot [90 — α]) and the value of permanent deformation (0.003–0.05 percent), respectively, and we speak of the arbitrary limits of proportionality and the elasticity. The load-elongation curve of structural metals may have a maximum (point v in Figure 2), or it may be discontinuous when the maximum load P is reached. The relation Pv/F0 = σv characterizes the tensile (ultimate) strength of a material. When a maximum is present on the load-elongation curve in the region of loads that lie to the left of v on the curve, the specimen deforms uniformly over the entire length l0, gradually decreasing in diameter but retaining the original cylindrical or prismatic shape. Metals are strengthened during plastic deformation; therefore, despite the decrease in the cross section of the specimen, an increasing load must be applied for further deformation. The quantity σ1 like the arbitrary σ0.2, σn, and σe, characterizes the resistance of metals to plastic deformation. On the segment of the stress-strain diagram to the right of v, the shape of the stretched specimen changes: a period of concentrated deformation sets in and is expressed in the appearance of a “neck.” The decrease in cross section at the neck “overtakes” the strengthening of the metals. This accounts for the decrease in external load over the segment Pv−Pf. Plasticity characteristics. Plasticity of structural materials upon extension is evaluated in terms of the elongation δ = (lf − l0)/l0 X l00 percent, or the constriction ϕ = (F0 − Ff)/F0 X 100 percent; upon compression, in terms of the shortening Δ = (h0 − hf)/h0 X 100 percent (where h0 and hf are the initial and final heights of the specimen) ; and upon twisting, by the maximum angle of twist θ of the working part of the specimen, in radians, or by the relative shear γ = θr (where r is the radius of the specimen). The final ordinate of the stress-strain diagram (point f in Figure 2) characterizes the resistance to breaking Sf of the metal, which is defined as Sf = Pf/Ff (where Ff is the actual area at the point of the break). Failure characteristics. Failure does not take place instantaneously (at point f), but rather develops with time. The onset of failure may correspond to some intermediate point on the segment vf, and the entire process ends as the load gradually decreases to zero. The position of the point f on the stress-strain diagram is determined largely by the rigidity of the testing machine and the inertia of the measuring system. This makes the quantity Sf largely arbitrary. Upon extension, many structural metals (steels, including high-tensile steel, and also heat-resistant chromium-nickel alloys and soft aluminum alloys) fail after significant plastic deformation, resulting in the formation of a neck. The fracture surface often lies at an angle of approximately 45° to the direction of the tensile force (for example, in high-tensile aluminum alloys). Under certain conditions (for example, in the testing of cold-short steels in liquid nitrogen or hydrogen and upon exposure to tensile stresses and a corrosive environment for metals that are inclined to corrode under stress) failure takes place in sections perpendicular to the tensile force (even fracture), without macroplastic deformation. Figure 3. Specimen with a fatigue crack especially generated at the peak of the notch to determine K,c. 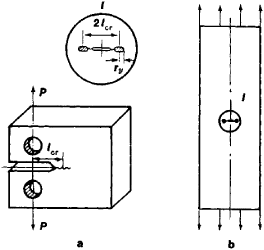 Tests for eccentric tension (a) and axial tension (b). is stretched, plastic deformation is impeded and is limited to a small region measuring 2ry (crosshatched area in Figure 3,b) that is adjacent to the end of the crack. Even fracture is usually characteristic of operational failures of structural elements. Such indexes as the critical coefficient of stress intensity under plane deformation K1c and the failure viscosity G1c = K21c/E, which were proposed by the American scientist G. R. Irwin as constants for the conditions of brittle fracture, have come into wide usage. Here the failure process is considered over time and the indexes K1c(G1c) refer to the critical moment when the stable development of the crack is disrupted; the crack becomes unstable and propagates spontaneously when the energy necessary to increase its length is less than the energy of elastic deformation reaching the apex of the crack from neighboring elastically stressed zones of the metal. Designating the thickness of the sample t and the size of the crack 2lcr, we proceed from the following requirement: lcr ≥ 2.5 (K1c/σ0.2)2 ≤ t. The coefficient of stress intensity K takes into account not only the value of the load, but also the length of the increasing crack: K = . ; (; takes into account the geometry of the crack and sample) is expressed in kgf/mm3/2 or MN/m3/2. The inclination of structural materials to brittle fracture under operating conditions can be assessed from K1c or G1c. Time dependence of strength. Plastic deformation strength and resistance to breaking decrease with increasing time of action of the load. In metals at room temperature this becomes especially noticeable upon exposure to a corrosive agent (corrosion under stress) or other active agent (the Rebinder effect). The phenomenon of creep—that is, the increase in plastic deformation with time under constant stress (Figure 4,a)—is observed at high temperatures. The creep strength of metals is evaluated by the arbitrary creep limit—most often by the stress under which plastic deformation reaches 0.2 percent in 100 hours—and is designated as σ0.2/100. The higher the temperature t, the more pronounced the creep and the greater the decrease in the fracture strength of the metal over time (Figure 4,b). The last property is characterized by the long-term strength, which is the stress that induces rupture of the material at a given temperature over a given time (for example, σt100 and σt1,000). The temperature-time dependence of strength and deformation is more marked for polymers than for metals. When plastics are heated, highly elastic reversible deformation is observed. Beginning at a certain higher temperature, irreversible deformation associated with the transition of the material to the state of viscous flow develops. Another important mechanical property of materials—the tendency toward stress relaxation, that is, toward a gradual decrease in stress under conditions in which the total (elastic and plastic) deformation maintains a constant, prescribed value (for example, in tightened bolts)—is also associated with creep. Stress relaxation is due to an increase in the share of the plastic component of the total deformation and to a decrease in its elastic component. (where R = σmin/σmax characterizes the asymmetry of the cycle). In the fatigue process it is possible to single out the period that precedes the formation of the center of fatigue fracture, and also the period that follows it, which is sometimes very long (the period of development of the fatigue crack). The more slowly the crack develops, the more reliably the material functions in a structure. The rate of development of the fatigue crack dl/dN is related to the coefficient of stress intensity by the exponential function dl/dN = cKn. Thermal fatigue resistance is also distinguished. In this case the stresses that appear in the material are caused by the fact that, for various reasons (for example, because of the shape of the part or the nature of its attachment), the thermal displacements that occur upon a cyclic change in temperature cannot be realized. The thermal fatigue resistance also depends on many other properties of a material, such as the coefficient of linear expansion, thermal diffusivity, elastic modulus, and the elastic limit. Davidenkov, N. N. Dinamicheskie ispytaniia metallov, 2nd ed. Leningrad-Moscow, 1936. Ratner, S. I. Razrushenie pri povtornykh nagruzkakh. Moscow, 1959. Serensen, S. V., V. P. Kogaev, and R. M. Shneiderovich. Nesushchaia sposobnost’ i raschety detalei mashin na proshnost’, 2nd ed. Moscow, 1963. Fridman, la. B. Mekhanicheskie svoistva metallov, 3rd ed. Moscow, 1974. Metody ispytaniia, kontrolia i issledovaniia mashinostroite’nykh materialov, vol. 2. Edited by A. T. Tumanov. Moscow, 1974. Contract award notice: Tribology test equipment for laboratory of mechanical properties of materials. Headquartered in Eden Prairie, Minnesota, privately-held Hysitron has developed solutions to measure mechanical properties of materials at the nanoscale since 1992. Tensile testing was used to evaluate the mechanical properties of materials, and is an inexpensive and fully standardized procedure . Their topics include the degradation of mechanical properties of materials at high temperature in corrosive environments; high-temperature corrosion problems in refineries, chemical process industries, and petrochemical plants; high-temperature corrosion problems in aircraft, coating for high-temperature applications, and the role of nanotechnology in combating high-temperature corrosion. Residual lifetime assessment is unthinkable without the knowledge of mechanical properties of materials prior to operation and mechanical properties after actual time of operation (actual mechanical properties), because the material properties can be reduced throughout the service life . Instron, a leading provider of testing equipment designed to evaluate mechanical properties of materials and components, conducted in-house studies to show how to overcome factors that influence melt flow test results or cause reduced repeatability. The topics include fundamentals of elasto-plastic mechanics, testing material fracture toughness, mechanical properties of materials in environmental media, mechanical properties of thin films, and ceramics and the mechanical properties of ceramic coating material. It has been established that in case of dynamic unbalanced processes the interaction between structural elements of materials with electromagnetic, ultrasound, force and other energetic fields stimulates self-organized processes with the formation of new spatial-temporal dissipative structures that cause a significant modification of the initial mechanical properties of materials . of Paris VI, France) compile 12 chapters that explore dynamic testing of mechanical properties of materials, the methods used, and the experiments performed, with a focus on the context of bounded medium elastodynamics. This provider of testing equipment solutions designed to evaluate mechanical properties of materials and components announced the commissioning of an extra-height 600 kN universal testing system with the capability for tensile testing of advanced structural composites between -80[degrees]C and +350[degrees]C at Hexcel Composites in Duxford, U. The ultra-low-force materials testing machine, the FlexTester, measures the mechanical properties of materials at forces down to 0. Norwood, MA-based Instron, a provider of testing equipment designed to evaluate mechanical properties of materials and components, has launched its 3300 single-column medical device testing system for applications such as needles, sutures, tubing, medical packaging and gloves.